Answering this question is extremely subjective. Determining the value of something is a process as unique as you are. Something that’s worth it to your neighbor or a family member might not worth it to you. But to help you determine the value of owning an electric scooter, we can explore the costs to and benefits of ownership. At the end of this exploration, you should have enough information to determine for yourself if owning an electric scooter is worth it. The financial cost of owning an electric scooter is much lower than owning other forms of transportation such as a car or a motorcycle. But you should still consider the costs. There are four components to the cost of owning an electric scooter. Cost of the electric scooter: This is the most obvious cost and almost goes without saying, but yes, you actually need to pay for the scooter. And the prices do vary quite a bit. You can pick up an electric scooter for a few hundred quid up to £1,500. Do your research. The correlation between price isn’t always strong, so understand which features are included, consider the price point that you are comfortable with, and read reviews. Cost of protective gear: You’re smart. Smart enough to know that while electric scooters are fun, they’re not toys. Self-protection should be a top concern for you every time you ride on or in any type of vehicle that moves faster than walking speed. So, you’ll need to invest in the proper protective gear. This includes a helmet, elbow pads and knee pads. After all, eScooters designed for fast and easy commuting can reach top speeds up to 18 miles per hour. That’s plenty fast! Make sure your protective gear is certified to help protect your head from low force multiple impacts (ASTM Standard) and single high impacts (CPSC Certified). Cost to replace scooter: Even though an electric scooter is much cheaper to purchase and operate than a motorcycle or car, it has a limited lifetime. Expect to replace your scooter every five years. But as the electric personal transportation market continues to mature, you can expect prices to drop. Owning an electric scooter isn’t all about costs. There are plenty of benefits to go along with ownership. Here are the top ten benefits you’ll reap by purchasing an electric scooter. Easy assembly. An electric scooter is easy to assemble. Most models can be assembled in as little as ten minutes – especially the foldable models. Just unfold, attach the handle grips, charge up the battery and go. They’re fun. Don’t you want to feel like a kid again? Owning an eScooter is one way to relive the good ol’ days of riding in the open air, with the wind blowing through your hair. We all deserve a bit of fun now and then, right? Easy to park. 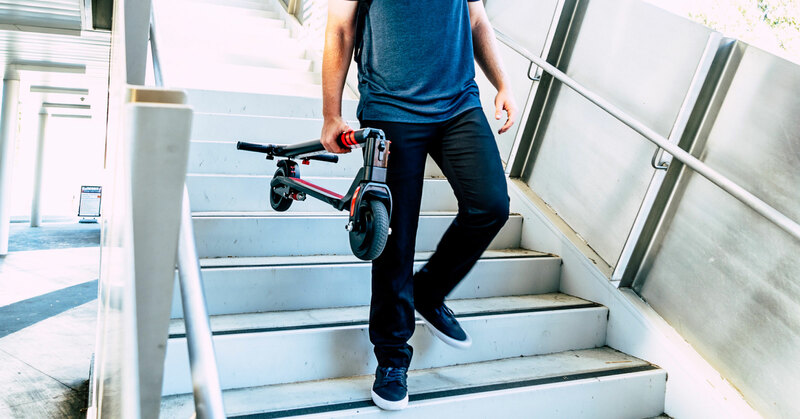 Most electric scooters are small and lightweight enough to fit in your office, in a school locker or in a grocery cart. But if you absolutely need to park your electric scooter, you have plenty of options. Bike racks are virtually everywhere, and many bike locks can be used to secure your scooter. Saves you time. Because a scooter is small and easy to operate, you can more easily navigate through traffic congestion. You’ll get where you’re going quicker and, dare we say, better. License requirements: Because of their limited speed, many Countries do not require you to have a license. Before you ride, ensure that you become familiar with your local electric scooter regulations. Easily portable. An electric scooter is usually lightweight enough to carry with you on the bus, tram or tube. And some, like our Tracer scooters, can be easily folded so that you can store them in compact spaces. Cost of maintenance: Maintaining an electric scooter is less expensive than owning a motorcycle or car. Our Tracer scooter features a revolutionary airless honeycomb-style rear tire that helps you say goodbye to flat tires. They’re electric. No seriously, this is a huge advantage. Electric scooters are cheaper to operate when compared to traditional fuel-based scooters and bikes. Instead of hopping in your car for short trips and quick errands, hop on your electric scooter. They are affordable. An electric scooter certainly costs far less than a motorcycle or a car. You can have a high-end scooter for just a few hundred dollars. Some manufactures, SWEGWAYFUN included, have invested heavily in lowering manufacturing costs while raising quality. Those savings are passed on to the you. So Are Electric Scooters Worth It? Let’s face it, an electric scooter is an exciting personal transportation vehicle that has captured the imaginations of urban commuters and campus cruisers the world over. And it’s easy to see why. They’re a fun, eco-friendly way to get around. Improvements in battery technology have made them more affordable and lighter than ever before, and SWEGWAYFUN is at the forefront of combining innovative design and industry-leading features with family-friendly pricing. Whether you’re using an eScooter as a last-mile solution or just to explore more of your world, there’s an electric scooter out there with your name on it.